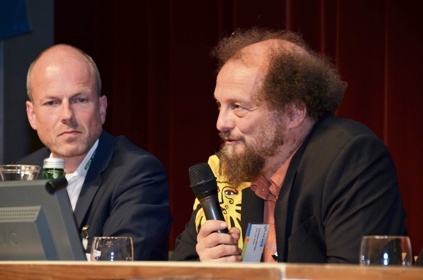 “Large-scale solar thermal systems in the GW range – an insignificant niche market or the future for solar thermal?” was the official title of a panel discussion at the Gleisdorf Solar conference in Austria in early May. The most important question was: What will be next for the planned 350 MWth solar district heating system called Big Solar in the Austrian city of Graz? “The challenge was to adapt the Danish district heating solutions to Austrian conditions,” emphasised the project’s initiator, Christian Holter (right), Managing Director of S.O.L.I.D. Meanwhile, Christian Stadler (left), Managing Director of one of Arcon-Sunmark’s subsidiaries, Arcon-Sunmark Germany & Austria, represented the company that has stated his own interest in realising Big Solar. Regional energy provider Energie Steiermark, which has been the supplier of Graz’s district heating network, is currently evaluating which company should build and operate Big Solar Graz – the large system comprising a huge solar field of 450,000 m² and seasonal storage of 1.8 million m³ – to provide energy to the city’s district heating network. “We intend to realise the project in collaboration with a specialist, and we would prefer to have a heat supply contract with a company which will built and operate the plant. We’re going to decide on that soon,” Gerald Moravi, Managing Director of Energie Steiermark, said during the panel discussion in Gleisdorf. Moravi stated that the feasibility study put the cost for the entire plant at around EUR 180 to 185 million. The price for the land is a rather big uncertainty in the assessment. Holter estimated both land and “conventional” installations like boilers and buildings etc. to account for 20 to 25 % of the cost. The solar field would require about half of the remaining money, whereas the storage unit would need a third of it, and the rest would be spent on the heat pump. Despite Energie Steiermark’s serious commitment to the project, Moravi said that its realisation shouldn’t be taken for granted. “We believe that we can secure the land this year and settle basic issues,” he said, although he cautioned that permits needed to be obtained and unforeseen troubles might lie ahead, for example, because of groundwater protection or the nearby airport. Holter also quoted World Bank data, which indicated the great potential of integrating solar heat into district heating systems in eastern and south-eastern Europe as well as central Asia – systems which have a total capacity of 1 TW or 1 million MW (the Graz heating network has a peak demand of 530 MW). “We won’t be able to apply the same design approach everywhere. We have to learn how to combine different technologies, make them part of a recipe for success. First, that means there’ll be more storage and second, more solar energy,” Holter said.